Your tree pledge will help to support local disadvantaged communities in the Great Rift Valley in Kenya, in addition to offsetting your carbon emission. These reforestation activities are being lead by a small community based project team called Escarpment Environment Conservation Network. Each tree planted helps to offset your environmental impact by "breathing" in CO2 as it grows. The trees also replenish sustainable habitat for wildlife and will enhance the natural landscape with native trees. 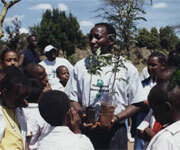 Our Kenya Reforestation programme incorporates "Tree Buddying". This means for each tree you pledge we also offset one tCO2e through a Verified Carbon Standard (VCS) project. in addition to delivering all the other great benefits of the Kenya Reforestation programme.